Recently, we have had a spell of peculiar weather. The morning will begin awfully cold -- high 50s/low 60s, progress to a funky early afternoon downpour, and then culminate in a hot, sunny late afternoon. Go figure?With these chilly mornings, it can be a bit difficult to rise and shine out of bed. Sometimes you just have to sleep in a bit and try to stay warm. Luckily, I have a big fur baby to snuggle with in the absence of Jeff. 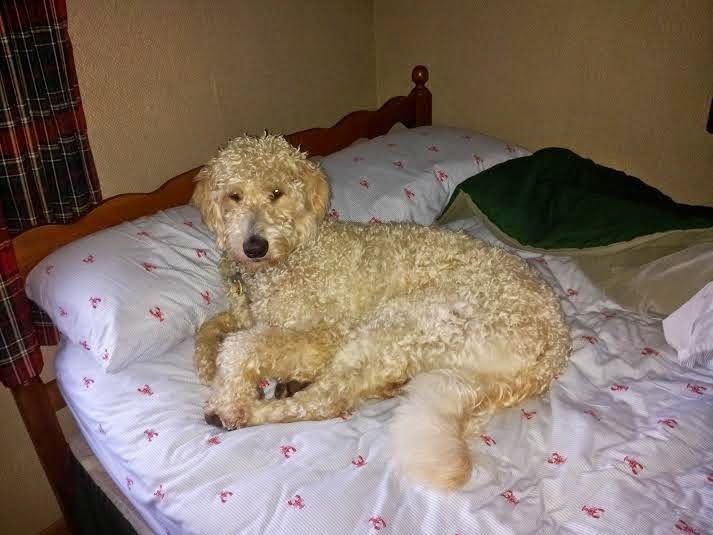 My goldendoodle does take up more than half the bed, but at least all of those flouncy curls serve a purpose other than being solely ornamental. On that note, my Aunt Carol and Uncle Jimmy arrive tomorrow from Georgia for a long visit; therefore, some dood is getting a much needed bath today. Over the past few weeks, I have fielded various complaints regarding Milton's fragrant aroma, which is not all sugar cookies and baby's breath. With swimming in the lake twice daily and an occasional dip in the ornamental ponds, he has a certain stench that pervades him whenever he walks in the room. This is one of those situations that if you fix it, it is just going to happen again, so I have been saving my energy for the monumental cleansing -- tonight! Milton also has mats galore, so a rigorous brushing is on the agenda as well. I suppose I should be calling this post "Fun Friday" because it is going to be a barrel of fun... Have a lovely weekend, everyone! Love the summer lobster sheets!